Requiring only light pruning, "Nellie R. Stevens" holly (Ilex x "Nellie R. Stevens") works well for screening and hedges or you can use it as a specimen plant. When this holly is pruned while it is young, it requires little or no pruning at its mature height of 20 to 30 feet and spread of 10 to 12 feet. 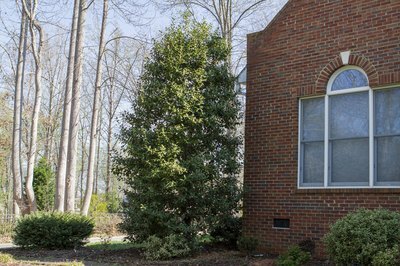 This low-maintenance evergreen holly withstands harsh environmental conditions, such as drought, poor drainage and air pollution where it grows in U.S. Department of Agriculture plant hardiness zones 6 through 9. "Nellie R. Stevens" holly grows in a broad, pyramidal shape. Prune a young holly to prevent bulk and overcrowding in the framework. Remove wayward branches or branches that cross other branches by making cuts parallel to the trunk or a large branch. Similarly, remove branches that create bulk within the framework. Thinning your "Nellie R. Stevens" while it is young creates a framework that improves air circulation and helps prevent disease. Prune to shape your "Nellie R. Stevens" for a more formal appearance. A shape that is broader at the bottom than at the top prevents shading of lower branches, which can result in dieback. Shorten individual branches to prevent a clipped look. Cut branches back to the desired outline by snipping off the ends of branches, making the cuts at a bud or leaf node on the outside of the branch. 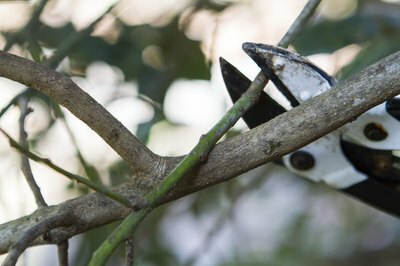 Use clean, sharp pruning tools to prevent the spread of disease and damage to your plant. 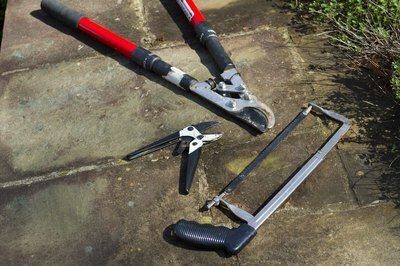 Use bypass-blade hand pruners and loppers to prevent crushing stems. For larger branches, use a pruning saw. Make cuts parallel to the collar on a main branch or trunk. Cutting into the collar damages the trunk or branch and encourages disease. You can prune holly at any time, but pruning in late winter prevents interference with the berry crop. 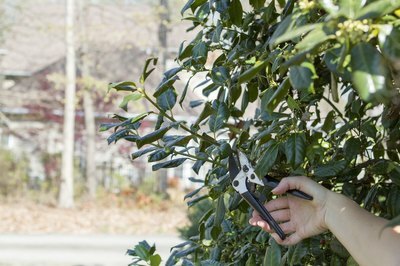 Because pruning stimulates new growth, it is best not to prune in late summer, as pruning stimulates new growth, which can be damaged by cold weather. Pruning equipment can spread disease from one plant to another. Disinfect your pruning equipment after each use. Use a disinfecting solution of 1 part household bleach or pine oil cleanser to 3 parts water, or 1 part rubbing or denatured alcohol to 1 part water. You can also use 1 part trisodium phosphate to 9 parts water or household cleanser full strength. Soak pruning equipment for five minutes in the disinfecting solution and then rinse with clean water.